When you’re exhibiting at a trade show or event alongside other companies in your field, it can be difficult to stand out from the crowd. Brandon Pletsch and his team at Radius Digital Science did just that as they were looking for a way to break through the noise of a busy convention space full of digital media. They turned to desktop 3D printing with the Form 1+ SLA (stereolithography) 3D printer as a way to effectively start the conversation about science with conference attendees. Radius Digital houses a team of medical artists, designers and project gurus in Montclair, NJ who produce animations, interactive media, and apps for healthcare clients. We spoke to the President/Cofounder, Brandon Pletsch, and Project Manager, Dolina Viemeister, about bringing their design from 2D screens to 3D printed, physical objects. To create their trade show display, their first instinct was to go with extrusion printers just to minimize the amount of on-site model finishing required. The model itself was designed to look like it's floating, so it was rife with overhangs. “What we didn't realize,” said Brandon, “was just how poorly the extrusion technology would adapt to the molecular model we had created.” After creating dozens of filament tumbleweeds, they realized they needed to change their approach. One of the employees at Radius Digital Science had seen Print the Legend and suggested buying a Form 1+ 3D printer. 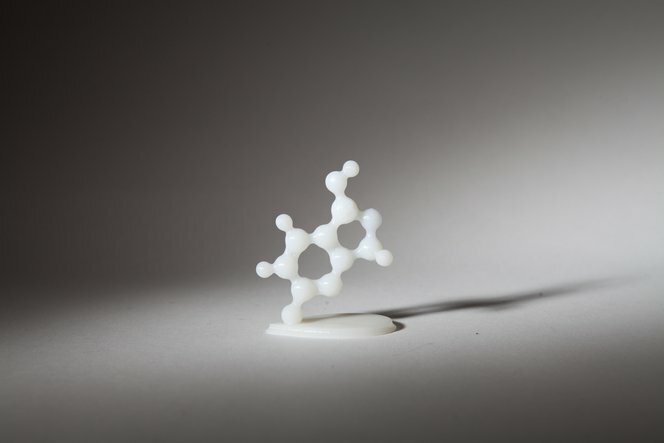 Radius Digital’s molecular model being printed on a Form 1+ 3D printer. With the Form 1+ 3D printer, the team quickly created over 150 high-resolution molecular models for their client’s exhibition booth, which were displayed against a custom LED blacklight table for an eye-catching installation. The display that Radius Digital Science created included their Form 1+ 3D printers in order to show the making of the models.